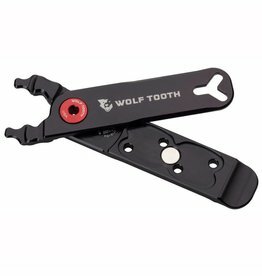 Wolf Tooth Pack Pliers is a multi-tool developed to provide functions that are not found on a typical multi-tool. It is light and compact so you can carry it with you. It has a tire lever, Presta valve core remover, valve stem lock nut wrench and a pliers to open and close a chain master link. It also provides storage for two sets of master links so you will always be prepared on the trail. Magnets hold the master links securely in place and self close the tool. 9-, 10-, 11- and 12-speed master links and chains.